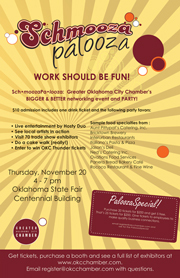 The Greater Oklahoma City Chamber of Commerce had hosted "Business After Hours" quarterly tradeshows, featuring free food, a DJ, cash bar, and exhibits, for about a decade. But after attendance at the events began to shrink, it looked for ways to entice new businesspeople to attend. The Greater Oklahoma City Chamber of Commerce had hosted “Business After Hours” quarterly tradeshows, featuring free food, a DJ, cash bar, and exhibits, for about a decade. But after attendance at the events began to shrink, it looked for ways to entice new businesspeople to attend. The organization invented SchmoozaPalooza, an enhanced version of the event with a digital slant, planning the first one last winter with a live band, $10 admission fee, and exhibitor booths. The chamber decided SchmoozaPalooza needed to move in an Internet-savvy direction, so it placed some event promotions on the Web. The group embraced social networking sites, including Twitter, Facebook, LinkedIn, and Plaxo, which allowed people who were already planning to attend the event to easily spread the word to friends and colleagues, quickly multiplying the event's potential attendees, says Jennifer Seaton, director of marketing and communications. It established accounts on major social networking sites to promote the twice-yearly event, and Seaton spent time speaking to groups whose members were likely to show up at SchmoozaPalooza, including the Public Relations Society of America and Women in Communications. The organization also posted flyers promoting the event and conducted e-mail and telephone outreach. Attendance at the first SchmoozaPalooza increased sharply from the preceding event, jumping from 200 to 725. The gathering also saw online success, registering 102 Twitter followers, 441 LinkedIn contacts, 209 Plaxo followers, and 528 Facebook friends. The group is working to promote another version of the event, planned for April.